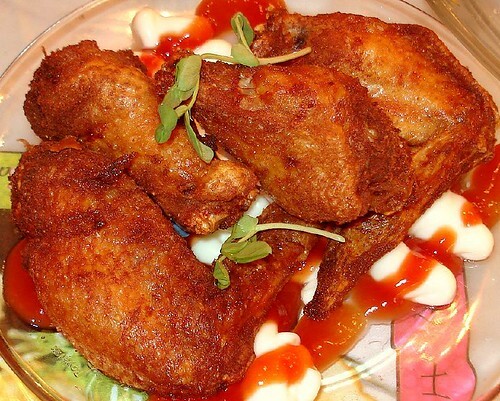 Chicken Winglets - TSC Style, originally uploaded by Camemberu. Mmmh, just had to blog this. Chicken wings from Tong Shui Cafe (again, yeah, sorry, I know a lot of people don't like this joint). Fried piping hot with crispy skin! You can have it four ways - BBQ sauce, etc, this is the regular or Tong Shui signature style. Never mind the bed of mayo and tomato sauce it sat on. The chicken was fine on its own. 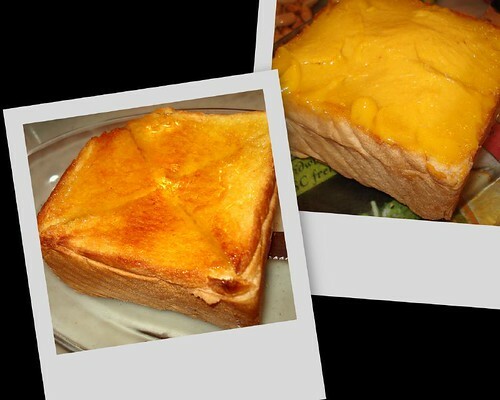 Thick toast - with butter and honey (left) and D24 durian puree, originally uploaded by Camemberu. We had to have more thick toast. The honey and butter version was golden brown and delicious, with the honey forming a shallow well in the centre of the cut toast. They were even more generous this time with the D24 durian puree too. 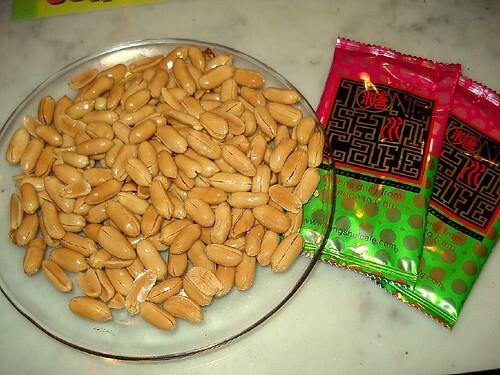 Platter of peanuts, originally uploaded by Camemberu. Interestingly, they gave us a huge plate of peanuts this time the minute we sat down - I'm not sure if it's an afternoon/teatime only thing (it was around 3pm). Forgot to take the receipt, so not sure if they charged us for this. Probably did. Those wet towels are added to the bill too, by the way. 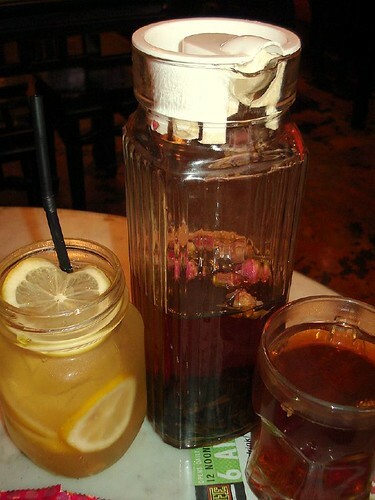 Honey Lemon drink (left) and Hot Pu Erh with Rosebuds Tea, originally uploaded by Camemberu. I wish I didn't have a cold...I would have loved to have that whole jar of cold honey lemon - I tried a sip, so refreshing! Well, I had my warm Pu Erh chinese tea with rosebuds (S$2.88 for whole pitcher), which actually was a good call. It cleansed all the oilyness away (from the chicken wings and sinful toast). I tried it at the Bugis Outlet with a friend twice over the last week, really liked it. Their durian Puree and peanut butter + condensed milk toast. They charge for the towels and peanuts($2.00 IIRC), but well, for that amount of peanuts, the $2 are much more worth it than many other places where they give you peanuts amount of peanuts for the same amount. My friend even commented that we could just check out the TV schedule of the chinese movie channel go there, order a drink, and eat peanuts, and watch the show there. I tried the recommendations you had in the previous post, really liked them. Well, the peanut butter and condensed milk toast was a mixed feeling, considering Im not a big fan of Peanut butter, and its sticky, hard to eat. But it had a unique and rich taste of peanut butter, I didn't really reject it. Though I guess people who like peanut butter would love it. Its pretty difficult to eat, my friend commented that if there was ever an eating competition, it'd probably be the boss stage and I wholeheartedly agree. Need to try the wings the next time we go there. hey i lurve hk food too! esp the pb french toast@novena, another branch of the east coast one!